The New York Association of Fire Equipment Distributors was founded more than 10 years ago to assist fire equipment companies with public safety and provide fire production industry information. 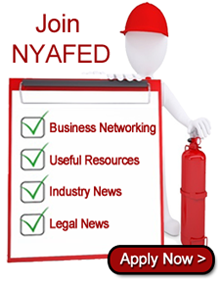 From business networking to legal news, the NYAFED offers everything you need to stay aware and informed in the industry. As a member of NYAFED, you will always be abreast of any changes in the industry and changes in jurisdictions within Suffolk County, Nassau County, Westchester County and New York City. Membership will also grant you full knowledge of any changes in the public safety industry, as well as any other subject matters that will directly affect you as a fire protection equipment company.